Savvy consumers know that many of the marketing claims on food packaging are misleading, if not downright false. “Organic” doesn’t mean, for example, that your vegetables are pesticide-free or that your meat is from animals raised outdoors. “Natural” doesn’t have anything to do with how the animal providing your meat lived, but merely with how the meat is processed after it died. “Humanely-raised” doesn’t even mean that your meat comes from an animal that’s raised humanely, as the Humane Society’s lawsuit against Purdue for using exactly that label on their chicken demonstrates. But one of the terms that I’ve always thought of as reliable is “grassfed.” Only applicable to ruminants, who can derive all their nutrition from grasses, you see it on beef or dairy products. And although, like many marketing terms, it’s not monitored by the USDA and therefore isn’t verified by anyone checking out the farms that use it (unless those farms voluntarily subscribe to an independent certification program) I’ve trusted that most farms that use the term are doing so in good faith. But there is a catch, which I discussed with Patricia Whisnant, the head of the American Grassfed Association. Theoretically, it would be possible for a farmer or rancher to feed his cattle grass – even to feed them entirely on grass and nothing else – and still confine them in feedlots. After all, the term “grassfed” technically refers to what the animals eat, not to how they are raised. The logical inference that a consumer would make – that if animals are fed grass, they must be out on pasture eating it – doesn’t necessarily hold. But if a farmer is going to feed his cattle grass, wouldn’t it make sense for him to let them harvest their own grass by grazing instead of going to the trouble to confine them, harveste the grass separately with his own labor, then feed it to them? Not necessarily. The thing is, grazing cattle expend more energy than feedlot cattle, because they’re walking around more. So a farmer could fatten his cows faster (and thereby make more money) by keeping them confined than by letting them graze – even if what they’re fed is 100% grass. Are farmers actually perverting the term “grassfed” by applying it to feedlot cattle? Whisnant doubts that it’s happening on any large scale, but acknowledges that the term is open to abuse. In light of that possibility, I’d plump for terms like “pasture-raised” as an alternative or addition to “grassfed” to guarantee to the consumer that animals are being raised in their natural environment. With our herd of Jersey and Guernsey cows, we strive to create the ideal Biodynamic farm – a self-sufficient system that builds and sustains soil fertility through crop rotation and farm composts. The cows graze from early spring through late fall, coming in only for milking. When necessary to meet demand, we purchase additional milk from neighboring Biodynamic and organic farms. These farms treat their land and animals as we do, with sound Biodynamic and organic practices and plenty of loving care. I’d be willing to bet that if I made a trip out to Phoenixville, I wouldn’t be disappointed. Posted by Angelique in Animal welfare. Hens crammed into battery cages. If there’s one stock image that animal welfare agencies have battered into our brains to convince us that conventional animal farming is bad, that’s the one. A bunch of featherless birds sticking their necks through wire netting, clambering over one another in their rows upon rows of cages stacked higher than you can reach. That image might not hold true for hens in the US forever, based on a rather surprising – shocking, even – turn of events. The egg industry and animal welfare activists, longtime foes, have come together to agree on a new way to raise hens. (Democrats and Republicans, take note.) The United Egg Producers, an industry association representing over eighty percent of US egg production, and the Humane Society of the US have agreed to replace battery cages with bigger cages designed not only to give the hens more room, but to “enrich” (that’s the technical term) their lives with amenities like perches and nest boxes. Even more extraordinarily, these two groups are trying to get their agreement set in stone as federal law. In a bill before Congress which had been part of the 2012 Farm Bill until it got axed yesterday, the Egg Products Inspection Act Amendments mandate that all egg producers – not just the majority represented by the United Egg Producers – follow the new guidelines. Although the egg bill can no longer ride on the coat-tails of the Farm Bill, I’m guessing it’ll be reintroduced in some other form presently. The twists and turns don’t stop there. The National Pork Producers Council, of all things (another industry association) has gotten into the fray by coming out publicly against the egg bill. Why would a bunch of pig farmers care about how hens are raised, you might ask? Turns out they don’t like the precedent it sets. Per the pork guys, this legislation marks the first time the federal government would get involved in setting production standards for farming. Given the current brouhaha over sow gestation crates, I guess they have reason to be worried. Upon reflection, though, perhaps the pig farmers have a point. It does seem a bit odd for the US government to take a stand on how many inches of space a hen should have. The vast majority of congresspeople can’t possible have a clue how much space hens need; what they’re supposed to be experts on is how to run a country, not how to run a farm. Would a better solution be to legalize the principle that food animals must be raised humanely and let the courts work out the inevitable battles about how to make that a reality? What do you think? In Righteous Porkchop: Finding a Life and Good Food Beyond Factory Farms, Nicollette Hahn Niman layers an amusing memoir of her journey from New York lawyer to California rancher over an investigative journalism-style exposé of conventional animal farming. Hahn Niman does a pretty good job of interweaving these two projects, so we wind up doing what I suspected she was hoping for in writing this book: absorbing the important but often dry facts about the modern livestock industry without dying of boredom. Hahn Niman’s tone is at times self-deprecating and at times earnest, but always engaging and forthright. I find her a kindred spirit, which is perhaps not surprising given that her priorities are exactly the same as mine. Animal welfare is priority number one; sustainability comes second; and local comes nowhere on the list. As she points out, local farms and slaughterhouses can exemplify the worst evils of the factory farm industry. Smithfield’s pig CAFOs, which Hahn Niman profiles, are local for the North Carolinians unfortunate enough to live near them. And sometimes meat is marketed as local even if components of it, like feed and manure, are transported long distances. Hahn Niman discusses all the major species used for food in the US and her analyses mostly hit the mark. She doesn’t attempt to catalogue every welfare concern with raising animals conventionally for food, so readers shouldn’t assume that RP tells the whole story. (For example, she doesn’t touch on the ubiquity of hunger in the breeding stock of meat chickens, which I consider to be one of the biggest problems.) After pointing out the flaws in the conventional industry, Hahn Niman showcases the virtues of humane, sustainable family farms and ranches like the one she lives on. Versus someone like Jonathan Safran Foer in Eating Animals, she recognizes that animals’ lives can be worth living (and therefore it can be morally acceptable for us to raise them for food) even if they’re not perfect. “Of course…there will be moments of stress, discomfort, and pain. But such moments will be part of every animal’s life, including every human’s.” (140) Couldn’t have said it better myself. One thing that might rankle for some of her readers, though, is that despite making all the right noises about eating ethically-produced meat, Hahn Niman is herself a long-standing vegetarian. She argues that meat-eating is morally justified because it is enshrined in the natural order of things. She sees “ospreys, hawks, bobcats, and coyotes” eating other animals on her ranch all the time (258), and accepts human omnivorism as part and parcel of nature’s rhythms. Two criticisms of that very common line of thought: first, other species don’t have the capacity for moral judgment, so their actions cannot be taken as a model for humans, who do have that ability. Animals also sometimes eat their own young; that doesn’t mean it’s OK for humans to do so. Second, Hahn Niman’s philosophical support for eating meat makes one wonder why she eschews it, and the fact that she does might make her seem insincere. I’m not particularly bothered by this, but I could see how some readers would be. If you’re looking for a good solid (but not exhaustive) discussion of conventional animal farming and its alternatives that’s also a diverting read, RP is a good place to start. Do our language choices take the “live” out of “livestock”? In the post “Mere words” I explored the fact that we typically use inanimate pronouns (“it”) rather than animate ones (“she”) to describe farm animals. Since you can’t kill an “it,” I guess it’s no surprise that we’ll use just about any other word than “kill” to describe what we do to them when it comes time to convert them from animals into meat. “Killing” has long been eschewed in favor of the slightly more mechanistic “slaughter.” Not content with using “slaughter,” though, we are now supposed to describe it as “processing.” Several people I’ve interviewed, including owners of humane slaughterhouses and representatives of animal welfare organizations, have stopped me in my tracks when I’ve asked them about how slaughterhouses operate and advised me to say “processing plant” because it’s not considered polite to say “slaughterhouse.” Never mind the vagueness that the word “processing” suffers from – after all, turning cuts of meat into sausage is also “processing” but has nothing to do with killing. Then there are lesser, but still notable, violations of linguistic integrity. “Beak trimming” Instead of “debeaking”. “Tail docking” and “toe clipping” instead of “amputation.” Even using the word “feed” instead of “food” drives a tiny little wedge between animals and us. And eases us into the process of forgetting. Baby calves give bunnies and puppies a run for their money on cuteness. But they present the dairy farmer with a not-so-cute dilemma. Unlike beef calves, dairy calves can’t be left with their moms to grow up – the milk their moms produce has to be sold for human consumption. So the farmer must figure out how to raise them (that is, how to raise the female calves that he’s keeping for his future dairy herd). 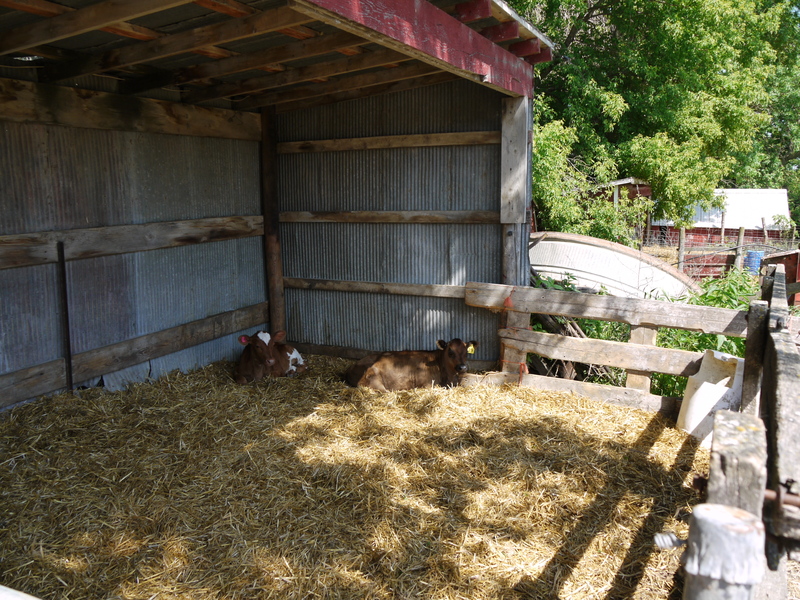 There are two main options: putting each calf in an individual hutch, and housing groups of calves together in pens. Unfortunately, from the calf’s perspective, neither is ideal. 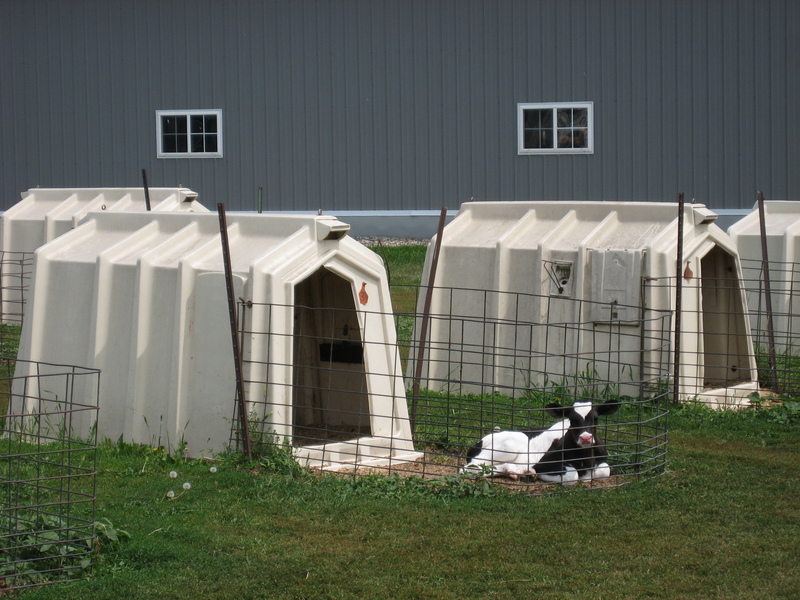 Calves in hutches spend their babyhood – from the day they are born to about eight weeks of age – profoundly alone. What passes for “companionship” for these calves is the sight of other calves in nearby hutches and the vet or farmer handling them for examinations and shots. However, hutches are popular with farmers, because they prevent disease from spreading from calf to calf. On the other hand, the alternative, grouping a few calves together in pens, at least gives calves some real companionship. It’s as simple as the fact that they can nose and rub other calves. But this very contact introduces a pathway for disease. It may not be much fun living out your youth alone, but it’s also not much fun to suffer bouts of pneumonia or diarrhea, both of which occur more frequently with group-housed than with single-housed calves. If we take a cool-headed look at the research that’s been done on this question, it would seem to suggest that individual hutches are better for calves. Not only do they do a better job of keeping calves healthy, but a review of recent work in this area notes that “The social skills of individually penned calves can equal that of group reared calves if they are able to have visual contact with their peers.”* Which leads one to believe that it can’t be so bad for them to be alone. But I’ve got to admit that one of the most heart-wrenching moments I’ve ever had at a farm was visiting newborn calves in hutches. At Wolf Creek Dairy in Dundas, Minnesota, Barb Liebenstein runs a 480-head conventional dairy farm as part of the Land O’ Lakes co-op. When I visited, Barb had calves from two to four days old in her hutches. Barb and I walked over to one for a closer look, and as soon as we approached, the little one scrambled up on her unsteady legs, took a few steps forward, gave us each an inquisitive glance, and nuzzled her head against Barb’s hand. Even one nuzzle would have been touching, but what stayed with me long after I left the farm was how this calf just couldn’t get enough. Every time Barb took her hand away after a couple of rubs, she stretched out her neck and flipped Barb’s hand up with her nose for more. Seeing this calf beg for a shred of physical closeness from the only living being who happened to be within range… well, you’d have to have had a heart of stone to be unmoved. The irony of the fact that she was begging for the favors of the person who was ultimately responsible for her isolation wasn’t lost on me either. I’ve also seen group-housed calves. That’s how Michelle and Roger Benrud raise their calves at a dairy about half the size of Barb’s that is part of a Minnesota co-op called Pastureland. Take a look at these pictures of the Liebenstein and Benrud farms and tell me: what do you think? *Moore et al., “Calf Housing and Environments Series, III: Hutches or Group Pens for Pre-Weaned Calves?” Washington State University Veterinary Medicine Extension, Ag Animal Health Spotlight Newsletter, December 2010. Illustrious chefs Thomas Keller and Andoni Luis Adoriz made some waves in the food world last week by unapologetically announcing that they have more important things to worry about than the ethics of the food they serve. In an interview in the New York Times, Keller and Adoriz pooh-pooh supporting local farmers, defending food traditions, and reducing food miles, all sacred cows of the sustainable food movement. Predictably, they were raked over the coals by food writers everywhere, whose consciences will presumably no longer allow them the pleasure of spending half a thousand dollars to grab a bite at Keller’s restaurant Per Se. Is the sustainable food movement’s collective “tsk tsk” warranted? Yes and no. Keller and Adoriz are right that they are not responsible for supporting local farmers or defending food traditions. If you like Farmer Joe just down the road and want to buy your rutabagas from him, by all means do so. But a farmer from Mayberry doesn’t “deserve” your food dollars more than a farmer from Mexico or a farmer from Malaysia just because he happens to live near you, as I’ve discussed in a past post. While you might enjoy keeping your money within your community, ethics doesn’t demand it. Food traditions are even further from ethical concerns; eating traditionally is a pastime, not a duty. So I have no problem with Keller and Adoriz focusing on innovating rather than preserving. When it comes to food miles, though, I start to get queasy. It’s not clear whether patronizing small local farms really minimizes your food miles; it depends on things like how far you have to drive to get to a farmers market versus a supermarket, for example. (If you have to drive a lot further to get to a farmers market, your driving contributes more to global warming and ups the carbon footprint of the food you buy.) If Keller and Adoriz were questioning the link between buying local and food miles/ global warming/ sustainability, I’d be right there with them. With all the hullabaloo recently over the FDA’s attempts to regulate the administration of antibiotics to livestock (which resulted in the agency encouraging producers to voluntarily reduce their antibiotic use) I thought I’d give my take on it. First, an all-or-nothing approach to antibiotic use isn’t good for animals, so I don’t support it. One of the problems with organic regulations is that they ban antibiotic use entirely, which means that if a farmer wants to sell an animal’s meat as organic, he can’t give that animal antibiotics even if the animal is sick and needs them. That creates a perverse incentive for organic farmers to let their animals suffer. But in general, yes, antibiotics are used when they’re not needed – specifically, to speed up growth so that animals reach market weight faster. (Scientists are still researching why this works, but it does.) And they’re used to ward off diseases that wouldn’t pose such a risk to animals if they weren’t crowded into the CAFOs that characterize modern conventional agriculture. For example, antibiotics are prescribed for pigs to prevent Swine Respiratory Disease (SRD). But pigs wouldn’t be so susceptible to SRD, various forms of which make them literally cough until they die (SRD is the leading cause of pig mortality in the US), if they weren’t packed like sardines into barns reeking of ammonia. So I’m most emphatically for limiting the administration of antibiotics to livestock, if it would compel farmers to improve their living conditions. However, removing the crutch of antibiotics without changing the rest of the system would be a disaster – for farmers and animals alike. A disappointing update on the progress of “ag-gag” bills that criminalize undercover investigations of animal abuse at farms and slaughterhouses: Utah’s governor just signed a bill into law that punishes secretly filming farm operations with jailtime. A similar bill is going through Missouri’s legislature, and a slightly different version has already passed in Iowa, as I reported here. This is getting scary. Animals’ voices are being strangled, state by state. I didn’t win the New York Times essay contest on why it’s ethical to eat meat. My ego heaves a great big sigh. I’m not going to post the essay I submitted, but for interested readers, my argument in favor of eating animal products basically expands upon point one of the article I wrote for Simple, Good, and Tasty here. The six finalists whose essays were published by the Times last week had a lot in common. Some of them had either been vegetarian for many years or still were; some of them were farmers who had personal experience with killing animals for food. Their arguments had a lot in common too. Maybe half of them justified killing animals for food because animal manure is needed to fertilize the soil for growing crops. This implies that even if you want to be a vegetarian or vegan, domestic livestock are necessary to producing your food. So you may as well eat them, too. I think this is quite a good argument, although it doesn’t defend the virtues of meat-eating as directly as I would like. Eating meat becomes, not something morally acceptable in its own right, but a necessary evil, part of the system. The bigger logical problem with the argument, though, is that someone who doesn’t accept killing animals for food could simply say that insofar as they’re needed for fertilizer (and we do have synthetic fertilizer, so they’re arguably not needed) we should keep small herds for that purpose and allow them to live out their days on the land, letting them die of old age. As crazily impractical as that sounds, it’s certainly possible. Farmers would build the cost of keeping animals into the prices they charged for their grains, veggies, and fruits, just as they now build the cost of their own labor and the costs of their tractors and combines into it. The notion that animals are needed to raise plants doesn’t really end up justifying killing the animals. I voted for the essay “For What Shall We Be Blamed – And Why?” although I disagree mightily with it. The author makes a philosophically interesting distinction between what is unethical and what is blameworthy. I agree with him/her that there are some things we do that are unethical, but for which we cannot reasonably be blamed. One is experimenting on animals to develop medical treatments. I disagree, though, that eating meat qualifies as one of these unethical but blameless activities. It’s just too easy not to do, as millions of vegetarians prove. Still, it’s a proposal worth considering.